Teach Aqua Fit and Water Aerobics Classes at the Waikoloa Beach Marriott Infinity Pool! 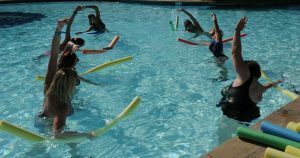 We’re looking for a qualified Aqua Fit Water Aerobics Instructor to teach a fun and lively class at the Waikoloa Beach Marriott Resort and Spa on Saturdays and Sundays, and possibly fill-in other days each week. This one hour class is scheduled daily at 9:30 AM. You’ll have complete freedom to design and teach your class your way! A reliable, friendly, customer service oriented, can-do attitude is a must! We offer competitive pay. For more information, please email us at rgallegos@hawaiioceansports.com or call Ray at (808)339-1867. ← First Whale of the Season Spotted!